They will be the tallest towers between Jersey City and New Brunswick. The former site of Pagano’s Supermarket may become another supermarket, this time on the ground floor of Bayonne’s tallest buildings, and at the very top, a restaurant, according to an amended redevelopment plan approved by the Bayonne City Council on Jan. 16. 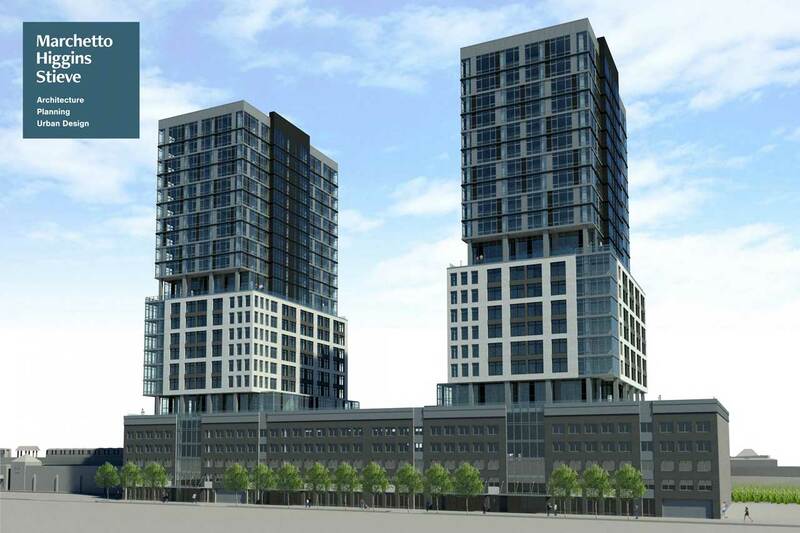 The twin 22-story towers planned for 26 North Street are being developed by the L Group, owned by Bayonne resident Lance Lucarelli, and designed by the Hoboken-based Marchetto Higgins Stieve. The towers, which are slated to contain 170 residential units each, are currently under construction and will define Bayonne’s skyline as the tallest buildings between Jersey City and New Brunswick. The Bayonne City Council approved a redevelopment plan that makes an exception to two building codes: that grocery stores cannot exceed 5,000 square feet and restaurants must be on the first floor of a building. The ground floor was always planned for commercial use; the developer wants to attract an “anchor” tenant, which, in this case, is hoped to be a supermarket such as Trader Joe’s. The problem, though, is that most grocery stores require more than 5,000 square feet of space. The city council amended the redevelopment agreement to allow the developer to use the entire first floor for the store. The floor plan for retail is between 13,000 and 15,000 square feet. Pagano’s Supermarket was about 10,000 square feet. The hotel planned for South Cove Commons was also granted permission for a top-floor restaurant. Some residents were critical of the plan to allow a ground-floor supermarket. Megan McNally, who lives across the street from the site, expressed concerns about congestion and parking. Another resident, Bruce Piggot, expressed concern about the economic impact. The L Group is also responsible for developing Park Bayonne across from Stephen R. Gregg Park and a 10-story residential building at 957 Broadway, the former site of Resnick’s Hardware, which moved ten blocks south. The towers are expected to be completed by the end of 2019 or the beginning of 2020.